Econo-Blast portables are compact pressure blasters that share many features with their big brother, SuperBlast. 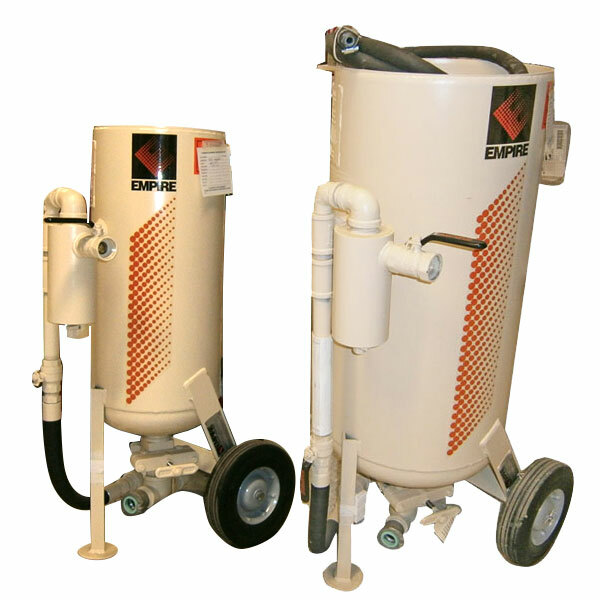 Available in 2 sizes with grit capacities of 1.5 and 3 cubic feet, includes ASME vessel certification for safety, flexible air hose for ease of maintenance, wheels for portability and a pressure gauge. Less grit capacity and smaller nozzles make these units ideal for spot blasting and detail work, particularly on a limited budget. Empire’s patented Sure-Flo grit valve and 680 or 780 remote controls, for safety. With these controls, blasting stops when the nozzle is released. Media Capacity* 150 lbs. 300 lbs. Weight 80 lbs. 102 lbs.